The sun is shining and it’s summertime at last and your toddlers need to play and you’re all out of ideas. 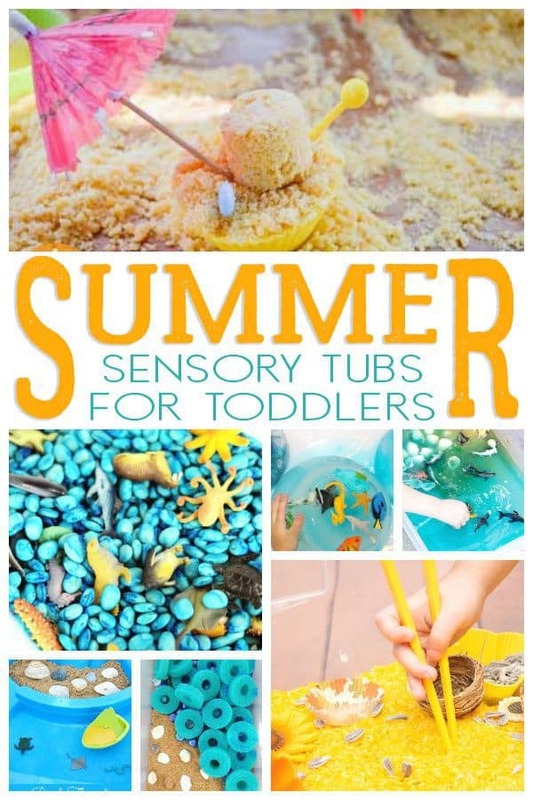 Discover these fantastic Summer Sensory Bin Ideas for you to set up for your little one this year. 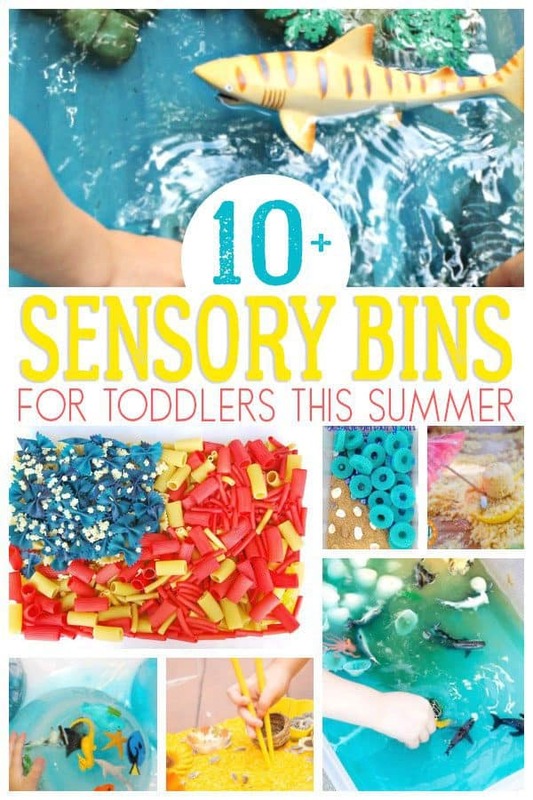 There are so many sensory bins that you could put together for toddlers during summer. Set up these tubs outside in the shade for your little ones and make it easier to clean up the fun. 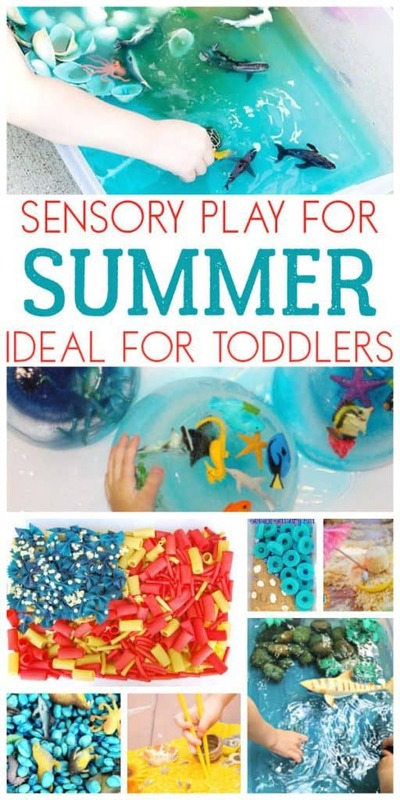 Even more ideas over on our Favourite Summer Sensory Play Ideas for Toddlers. 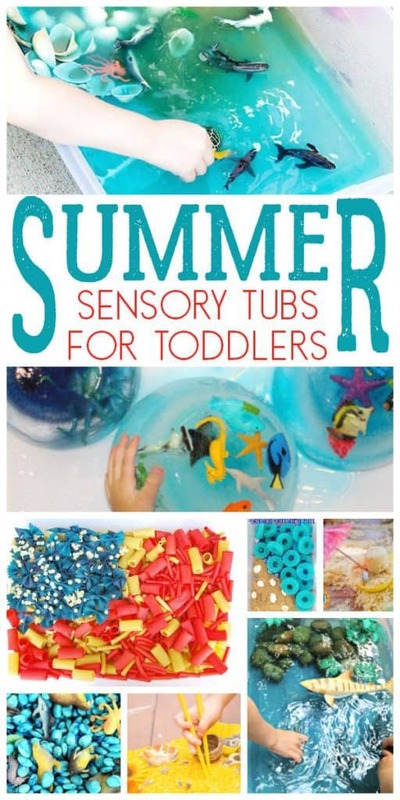 These classic summer-themed sensory tubs are such fun to set up you have to give them a try. I love this Fourth of July “Stars and Stripes” Sensory Bin from Paper and Glue. With taste safe materials it would have been ideal for my toddler that put everything in her mouth. Another cute and taste safe bin is this Water Melon Rice Sensory Bin from Little Bins for Little Hands. It’s easy to set up, and if your little one does put the dried rice in their mouth it won’t harm them. A big bonus put a lid on it and reuse it again and again. You can’t go wrong with simple ideas and this Water Sensory Tub from My Bored Toddler is that. Easy to set up and reuse time and time again it’s the perfect sort of tub that kids will spend hours and hours in. Sunflowers always remind me of summer, and this Sensory Bin from Life Over C’s is so pretty. With bright vibrant yellow as well as some real sunflower features in it. 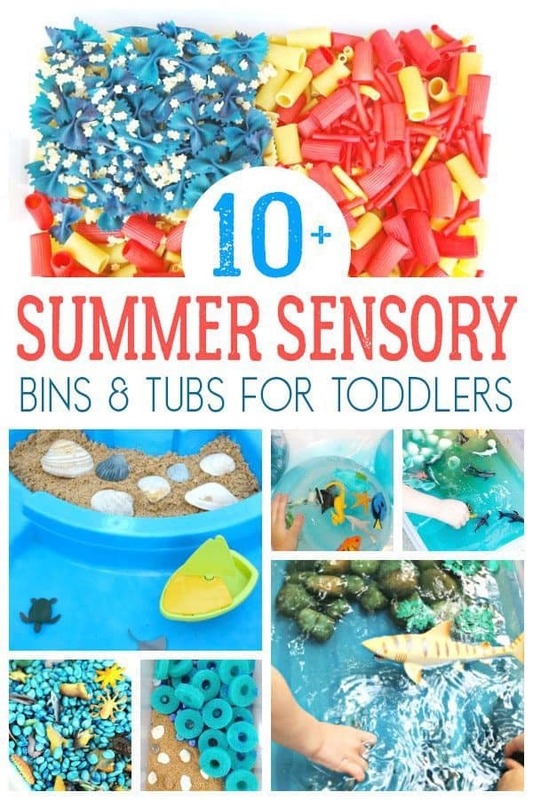 This last of our classic summer theme bins for toddlers is this Sensory Bin from Chaos and The Clutter. With lots of water in it’s sure to keep your little ones cool as the temperature rises. 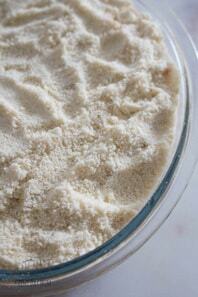 Try this simple edible Summer Sensory Activity Vanilla Pudding and Ice Sensory Tray. Keeps them cool and they can put it in their mouth as much as they want. Summer screams the beach for me! I want to go there, swim, play in the sand and have fun. These under the sea, ocean and beach themed sensory boxes are perfect for toddlers. One of the first sensory tubs we did with our toddlers was an edible taste safe ocean sensory box. 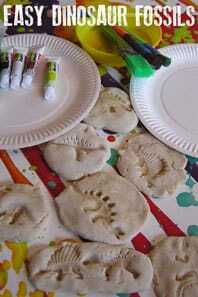 The kids loved it and although it was sticky it was a LOT of fun for them to play with. Another taste safe alternative to our ocean sensory bin is this Ocean Tub from A Dab of Glue will do. It doesn’t look as messy and I love the sorting element to it. 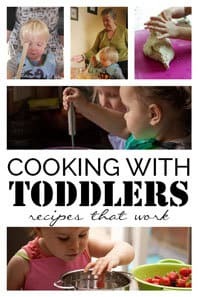 If you know that your toddlers not going to eat everything then this Seaside Sensory Bin by Chaos and the Clutter is great. You can make your sensory play large. 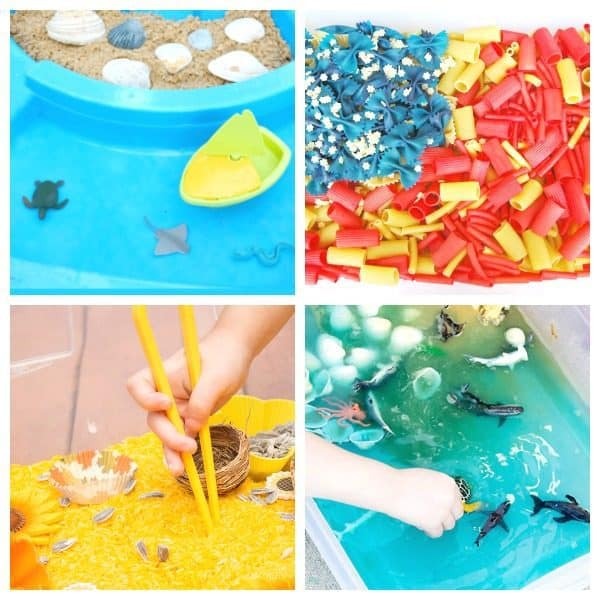 Use your water table like this beach themed water sensory table from Growing Hands-On Kids. Simple to set up and encourages free play. 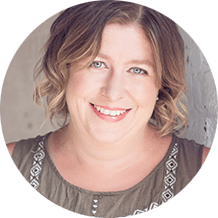 Relive memories of the beach and building sandcastles with this Edible Sensory Sand Activity from A Little Pinch of Perfect. With Shark Week during the summer, this Shark Sensory Tub from Mommy’s Bundle is great. It’s also not so messy which is always a bonus! Keep cool and explore the Under the Sea Theme with this Frozen Sensory Play from Natural Beach Living. Perfect for those hot summer days and it will keep your little ones cool. This Sand and Water Ocean Sensory Tub from Fun Learning for Kids is simple to set up and ideal for your little ones to play with. 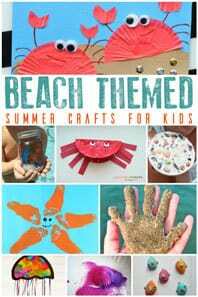 You could even take the tub and creatures to the beach with you and set this up for your little ones to play with. Add a little learning into your sensory play with this Catch the Fish Sensory Tub from Teaching 2 and 3-year-olds where you catch the fish and sort them. Make your summer fizz with this Fizzing Ocean Sensory Bin from Wild Flower Ramblings. 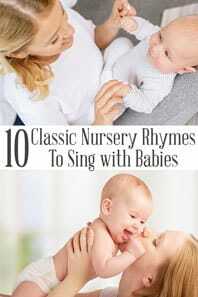 Check out the post for details of using the same tub but with babies that are sitting unaided as well. 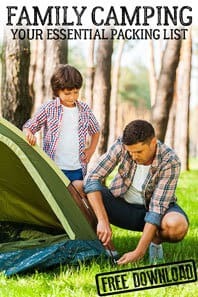 Host your own Sports Day for your Toddlers with these Summer Olympic Inspired Activities that are perfect for them to do. Create giant spiders webs in the garden inspired by one of our favourite Eric Carle Books – the Very Busy Spider. 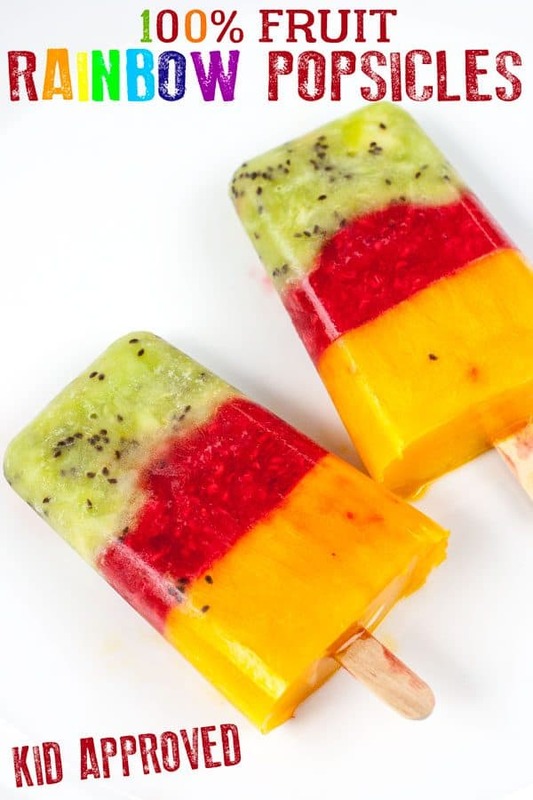 Make delicious 100% Fruit Popsicles that look like rainbows.